Forseen Fashions ← You Want Me To Wear What? As a result of writing this blog, I now have an almost encyclopedic knowledge of ugly fashions. After 300+ posts, I remember pretty much everything I’ve written about. Which is sad, given how much brain space is now devoted to remembering Forever 21′s variations on unflattering dresses. I feel a little bad for making fun of the Forever 21 dress – I thought this was just some random top they’d designed, but apparently they were just a season ahead of the curve. Their ripped dress even has studded embellishments, which actually makes it well worth it’s price tag of $29.80. 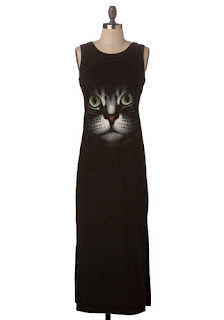 The cat dresses, on the other hand … I didn’t get it when ModCloth was selling this maxi, and I don’t get it now. Giant cat faces, people. On your torso. Even bedazzled, that doesn’t make it better. It just makes it reflective and therefore safe for jogging at night. Which is great, because the only time you should be wearing the a cat dress is at night. If no one sees it, great – they’ve been spared the mind-boggling confusion of why these dresses exist. If someone does see it, I feel like the “cat face emerging from torso” effect will be amplified by the low light.